It is not a vegetable peeler, nor a magnet. It is a curiosity, a design object created by Oriol Gener. 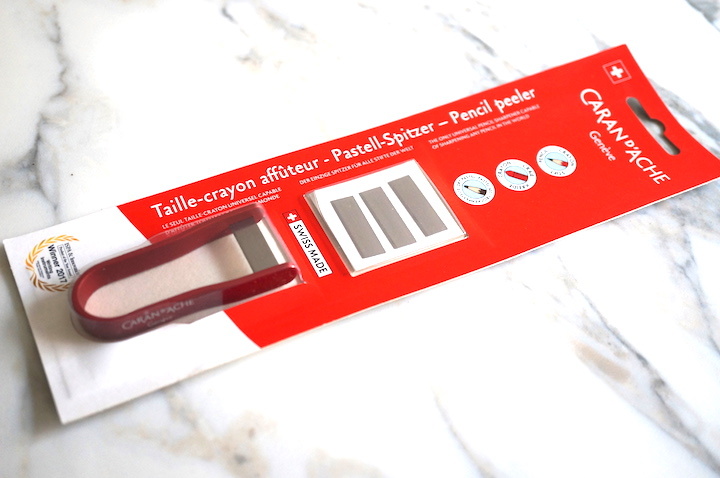 It claims to be able to sharpen a pencil. It is fun, and surprisingly miniature – from photos, I imagined a full-sized kitchen vegetable peeler – but it is comparable to the size and weight of a large coin. 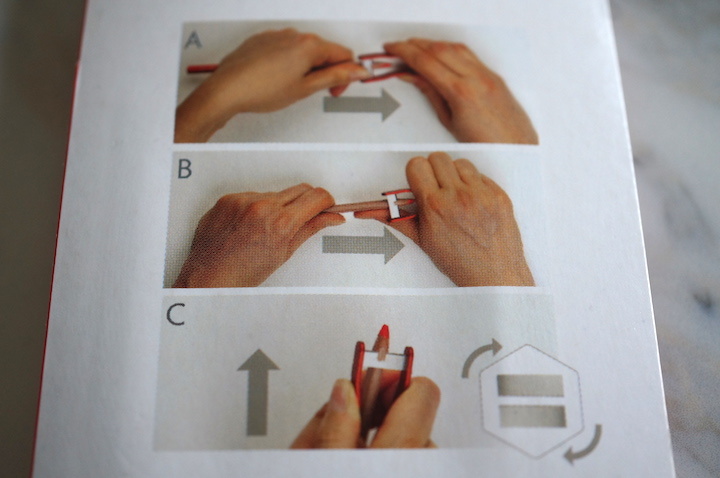 The packaging has instructional photos that I don’t find helpful. 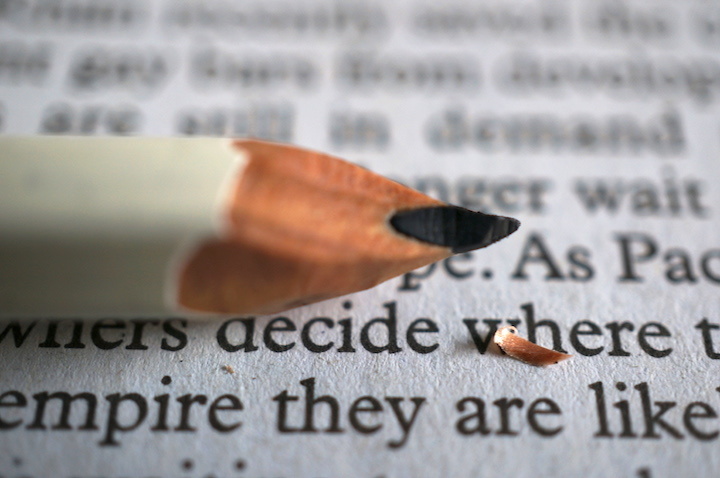 As one would imagine, you peel away at the pencil with the peeler’s blade. I’m quite ambiguous in my reaction. It just can’t be as consistent as a quality regular sharpener. It costs roughly $USD25. It benefits from softer woods. But it is a lot of fun. It’s isn’t worth the trouble to me. When When I don’t use a handheld sharpener, or a mechanical sharpener, I use a pocket knife. With a pocket knife, it’s far easier to produce a good point. Though I’m sure with some practice I could get have an easier time getting a good point with the C d’A pencil peeler, but given the better options available, what’s the point in that? Thank you for the comment. I agree that pocket knife devotees probably won’t be persuaded. Oh yes, I expected it to be bigger, as I was thinking of a vegetable peeler, too! Maybe because we happen to have a Swiss made Zena at home. Thanks for showing us the size of it. ? 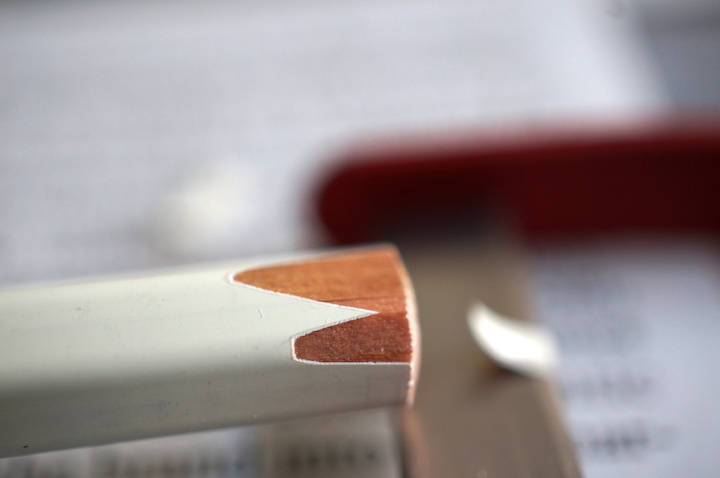 This sharpener looks so good! I wish it performs even better to match up with the price … but I still like the fact that it’s small enough to fit in a pencil case and being portable. I should note there is also a silver coloured version available. Thank you for showing this unusual accessory. I have tried it on the Paperworld 2017 when it was introduced but didn’t get a proper result. Maybe it requires practice but the main problem for me was the handling; I think a small knife is a lot easier to use. If you’re compelled to use something Swiss to sharpen a pencil, I’d say, go with a Swiss Army Knife. It will do a great job and. it is multi functional in the field. Not to mention less expensive for the smaller ones. Gunther, you are most welcome. I did think that I could wind up peeling away most of a pencil in the pursuit of a perfect point. Are these replacement blades in the first photo? If yes: Are they held by the spring force of the peeler? And: To what does “Winner 2017” refer? “Winner 2017” refers to the International Stationery Press Association, a confederation of several stationery trade magazines. 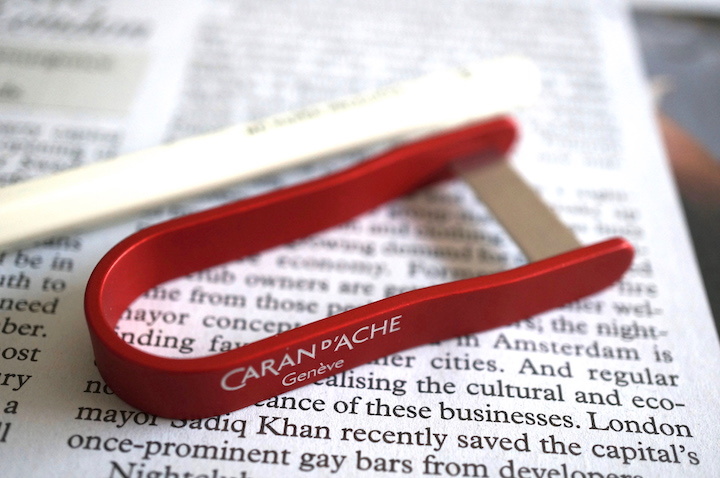 They awarded Caran d’Ache their 2017 Writing Instruments Award for this peeler and the scented “exotic” pencils! Stephen, thank you for the details. – Reading “Collection of four scented pencils made of rare wood” (emphasis mine) on the award page makes me chuckle. The marketing of Caran d’Ache has done a good job! One more question: Can these blades bought separately? Gunther, that I don’t know. I don’t see them for sale separately. That’s a good point about long term usability. One more note: If I understand the third diagram on the packaging, the blades may be installed facing the handle, or facing away. Re the direction of the blade: I think so too – on the Paperworld they had a red and a grey peeler with blades facing in opposite directions. The blade can be removed and replacing with the cutting edge facing the opposite direction fairly easy. I’ve been using this on and off, but it’s still just okay. I’d imagine someone not comfortable with a knife would enjoy this though. Thanks for the report, Mephisto. It’s actually the reissue of an old tool. I remember having seen a similar peeler in a case which contained my mother’s stationery; I’m talking about school stationery from the 50’s. It was made of a U-shaped polished steel wire holding a small dark steel blade, no more than 5 by 2 cm. And it’s a pity it’s gone. I am currently waiting for my peeler to arrive and checking the reviews and videos that have already been posted about it. My searches thus far have not yielded any source for additional spare blades. 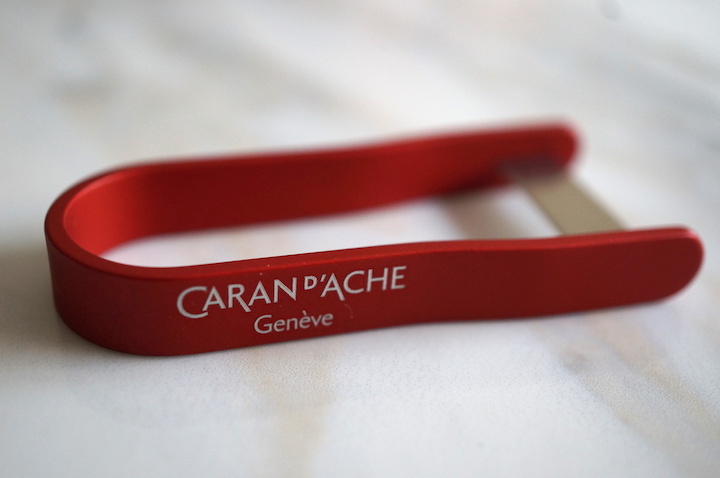 Has anyone contacted an official Caran D’Ache supplier or dealer to see if they can order blades separetely? They shouldn’t be too hard to get sharpened. You have more control with a knife, and for $25? Forget it! I could get a knife that does way more than that for that price. I know my comment is very reminiscent of others, but I just though that that is a kind of crappy design/idea.